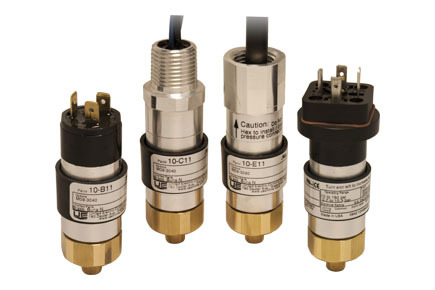 Available with seven electrical termination varieties, a choice of sensors, and several pressure connections, the United Electric (UE) Spectra 10 Series is designed to meet most requirements for a variety of OEM and industrial applications. Just 1-1/4 inches in diameter and as small as 3 inches high, this compact, cylindrical switch mounts wherever space is at a premium. A reliable and cost-effective switch, the UE Spectra 10 Series is ideal for applications with high settings and surges. Among the tough applications in which the product has proven itself are: mobile hydraulic units, compactors, balers and lube oil systems.